Looking back to April 2012, CITIES initiated research on local food logistics through our project Farming the City. With the support of Rabobank Amsterdam, CITIES’ research into utilizing local food as a tool for urban development gained extensive insight into Amsterdam’s local system. (View a short documentary covering our initial work: https://vimeo.com/40879300). The vision was to extend sustainable local food practices beyond production, processing and packaging efforts to collaboratively integrate sustainable food transport. Before this research, sustainable transport lacked, while emissions, congestion and pollution were in abundance. No emission. No congestion. No pollution. 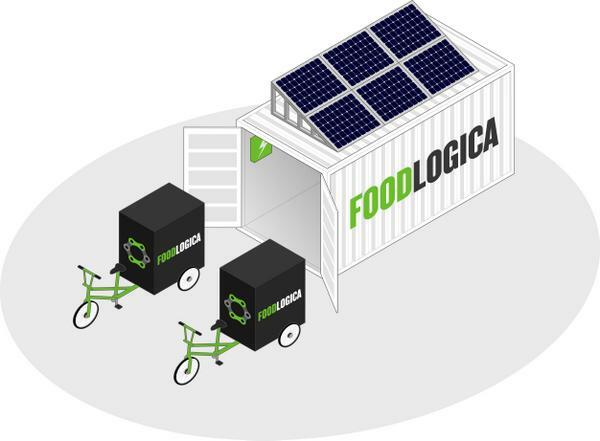 FOODLOGICA is an off the grid, solar powered, cargo e-trike logistical delivery service that links local food producers, businesses and consumers. Delivering fresh food fast and clean, FOODLOGICA maintains a commitment to both sustainable growing and working practices, seeking out high quality local food partners and developing working relationships for the long term. CITIES independently designed and built FOODLOGICA’s self-sustaining system from the ground up. Completely off-grid, our e-trikes are stored and charged in specially designed shipping containers retrofitted with solar panels. Running solely off solar and human energy, the crates, e-trikes and FOODLOGICA’s business can be set up and implemented anywhere the sun shines – free from fossil fuel. As the business grows and continues providing direct insight into local urban food systems, CITIES will continue evolving, adapting and pushing forward to advance better, more sustainable and resilient practices into local food consumption and urban development. FOODLOGICA is CITIES’ first registered commercial activity. CITIES Foundation is based in The Netherlands, working on urban analysis, research, communication and community-based project development. FOODLOGICA is a spin-off of CITIES’ Farming the City (http://farmingthecity.net) project, three-years and running in 2014, which serves as a global platform promoting sustainable and local consumption, production, transportation and processing of food.